Woo-Hoo! Not only are we celebrating a Sweet Sixteen birthday today, but now we have double reason to eat some cake. My step-daughter Megan just got some amazing news. 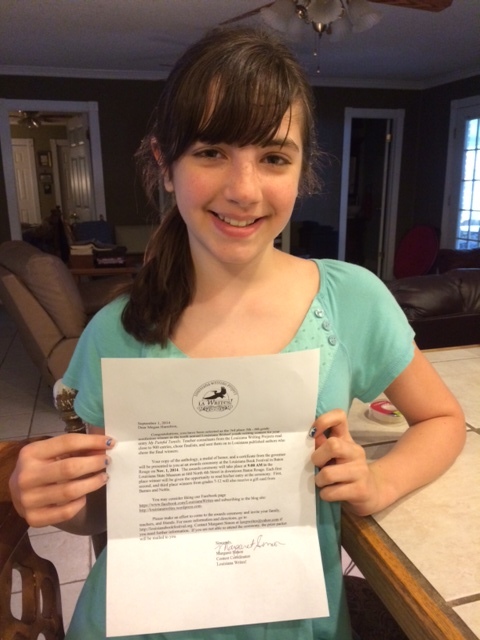 She is the 3rd place winner in the annual Louisiana Writes Youth Writing Contest! How wonderfully crazy is that?! Yes, we are just a tad bit excited around here. Megan has won first place in our local library’s Writes of Spring Youth Writing Contest for the past two years running, and she won second place the year prior to that. This year, one of the librarians asked us to send in her entry to the state youth writing competition, so we did not really thinking she had much of a chance to place in such a large contest. When that letter arrived in the afternoon mail, there was some squealing going on at our place! I bet the neighbors thought we had lost our minds over here … but we were just doing a little celebrating over Megan’s success! Megan with her letter of congratulations. In early November, Megan will have the opportunity to attend the Louisiana Book Fest, where she will receive a medal, a certificate from Louisiana Governor Bobby Jindal and an anthology of all the winning entries from the contest (which had over 900 stories and essays from children in grades K-12 from all around the state of Louisiana). Since I am bragging on my young author, I thought I’d share her essay with you. Enjoy! Have you ever been in a painful situation when the pain must get worse before it can get better? I have. This is the story of how I learned painful situations often bring about something good. That was the last thing I wanted to do, so I prayed my tonsils would be miraculously smaller. But when I met my new ENT, Dr. Barry, for the first time, I noticed his calm personality. All of my fears vanished away. Dr. Barry cheerfully said, “Open wide.” A moment later he added, “If today is a normal day for you, then your tonsils are definitely not normal size.” At that very moment, I knew exactly what was coming my way – surgery! Once the surgery was scheduled, I had a lot of questions. “Will it hurt? Will I be awake for it? Will I have to stay overnight in the hospital?” For the next three weeks, my parents patiently answered my questions, reassuring me a tonsillectomy was the best thing to help me feel better. Before long, it was surgery day. The night before I had packed a bag of comforting items, and bathed with special pre-surgical soap. I was physically ready to have my tonsils removed, but inside I was a nervous wreck! I had to be at the hospital very early. When I checked, I received a special bracelet to wear, before being taken to a pre-op room where lots of nurses bustled about. One of them put an IV in my hand. That hurt! I was glad I didn’t cry. Dr. Barry came before the surgery to tell me all the details, like how long the surgery would take. I felt reassured when he told me I wouldn’t remember any of it. An anesthesiologist came to give me medicine. I got very drowsy, although I do remember a nurse rolling my bed to the operating room, placing a mask over my face, and asking me to count to 100. “One. Two. Three.” I counted. The next thing I knew, I was waking up from a deep sleep. A nurse gave me ice chips for my throat. Soon, my parents walked into the recovery room, and my face lit up! Before my surgery, my parents took me shopping for special foods, like popsicles and ice cream. I made sure that our freezer was stocked with my favorite green popsicles. I figured the best part of having my tonsils removed was going to be all those treats! Unfortunately, after surgery I didn’t want anything to eat. My throat hurt so bad it felt like swallowing razors. After a week of green popsicles, I wished I would never see another one! Each day it seemed like the pain got worse. All of my siblings were outside riding bikes in the summer sun, while I was stuck inside with a throat that hurt worse than ever. It was so unfair! One day, I noticed my throat felt better, and in a few more days I forgot all about the surgery pain. But the really amazing day was when realized I never even thought about my throat at all anymore! For years, my throat had hurt. I never realized just how bad until the pain was gone. I hate pain. Yet, I learned a big lesson from my tonsillectomy: Sometimes pain is necessary if you want to feel better. What a great story! She is definitely a talented writer, how wonderful and blessed she is to have you by her side! So exciting! I remember winning writing contests when I was younger and it gives you great inspiration to continue to write, awesome! Congratulations, Megan! Your essay reminded me of the discomfort of my own tonsillectomy many years ago, but I have to admit, I’ve rarely had a sore throat since I got them taken out, and for that, I am thankful. She won’t say it but Paige has been a major force behind these kids doing so well with their writing, speeches, and other activities. Thank you for pouring yourself into Megan and all the other kids. It is a great thing to be a teacher and a mother. You are the best of both in my book!!! What a wonderful story. Megan is very talented. My sincere congratulations to her on her accomplishment!